This all-in-one device offers you an ability to charge your Apple gadgets whilst listening to the music. 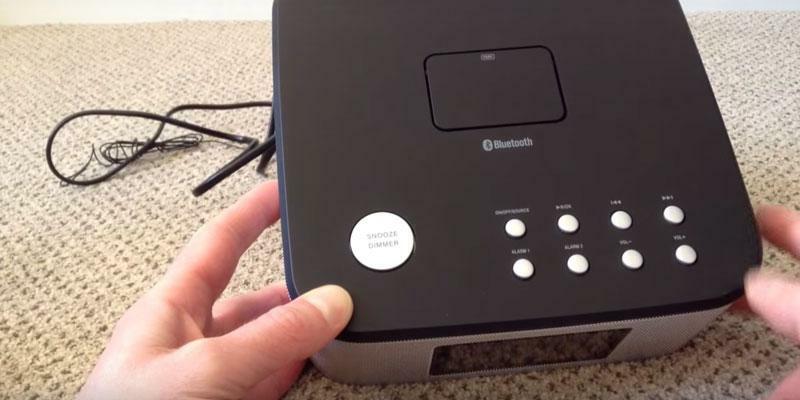 Can be also used as a Bluetooth speaker compatible with any available smartphone or tablet. 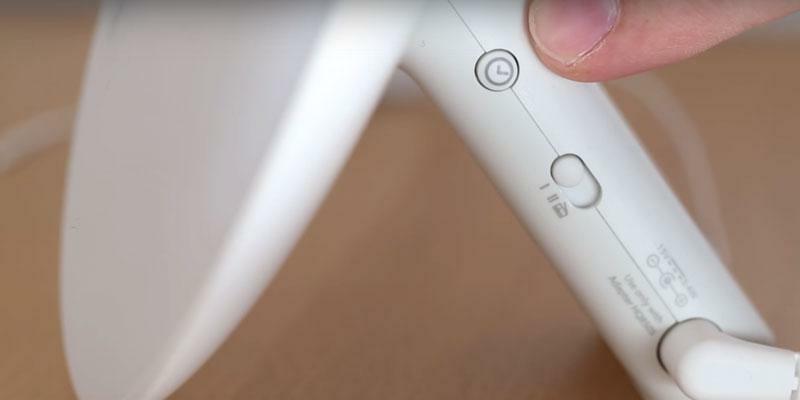 The device is too bulky to be placed on a bedside cabinet. 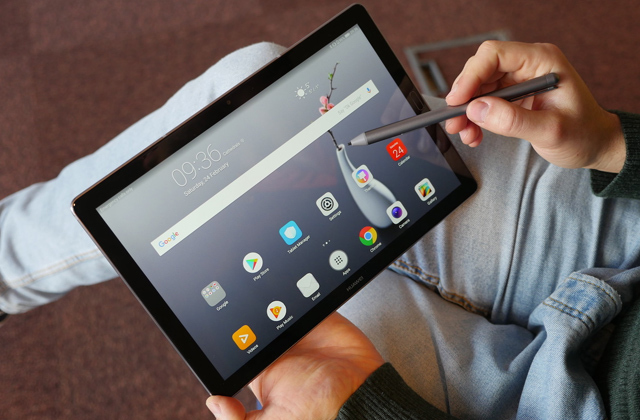 This terrific device would be highly appreciated by gadget lovers. Having purchased this stand-alone unit, you'll get an alarm clock, a media streamer, and a dock station in a single item. The alarm sound at up to 113 decibels is really enough to wake a heavy sleeper. Audio alarm, bed shaker, and flashlight signals can be combined or used separately. Might be too loud and irritative for light sleepers. Perfect for heavy sleepers. 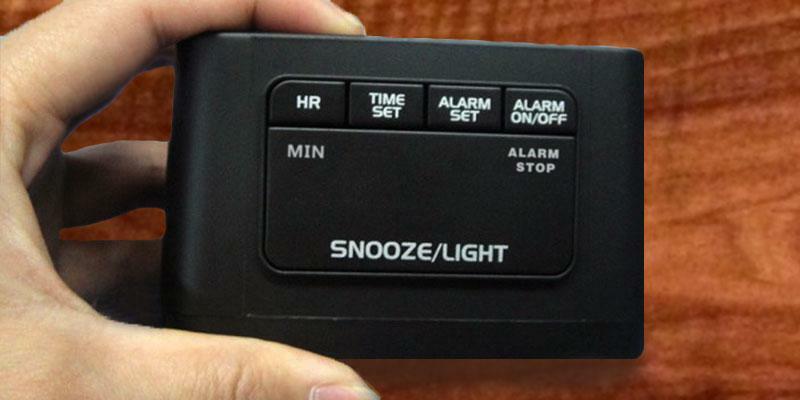 Due to the extra-loud alarm and bed shaker, you will never sleep through the alarm clock again. 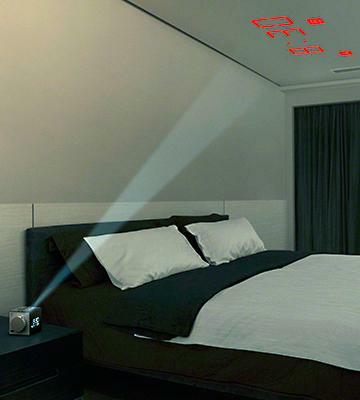 The swivelling projector allows you to display time on your walls or ceiling. 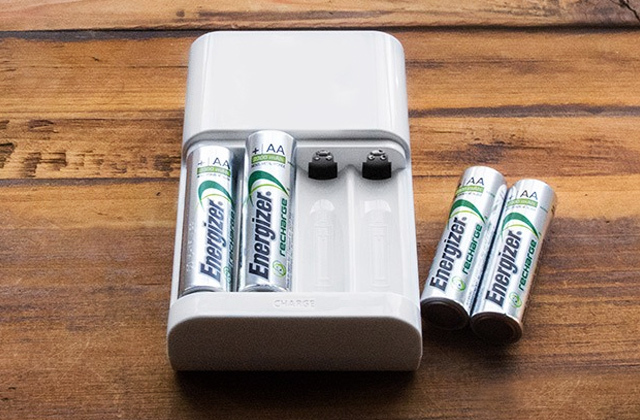 You can charge your gadgets using the built-in USB plug. The settings are quite intricate so following instructions is advisable. This model will ensure your pleasant awakening to the soothing nature sound. 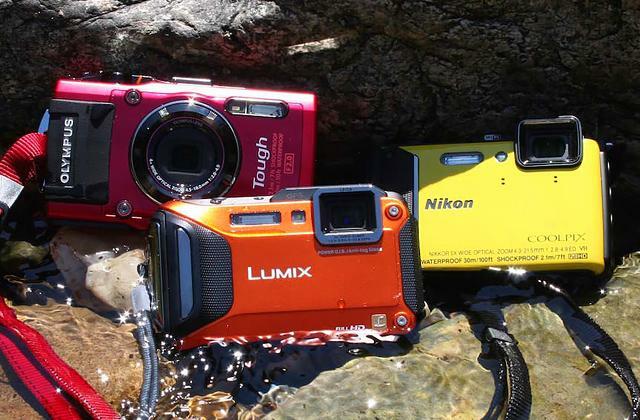 Perfect choice for people who prefer modern gadgets. 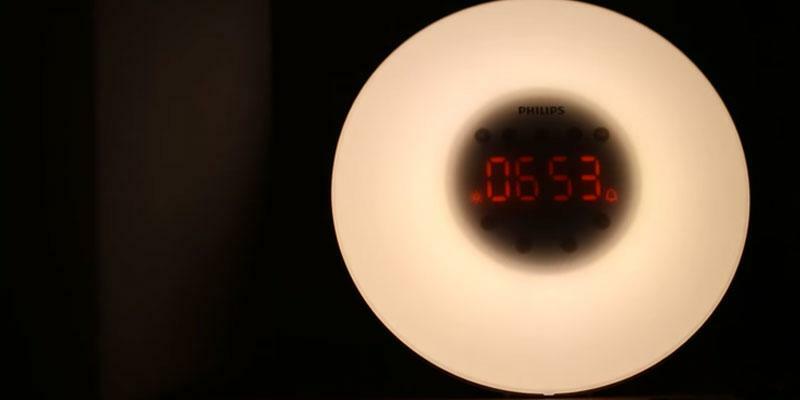 The alarm clock gives off soft light that won't bother you at bedtime. Sound and deep sleep is guaranteed. The numbers on the screen are poorly visible in bright light. 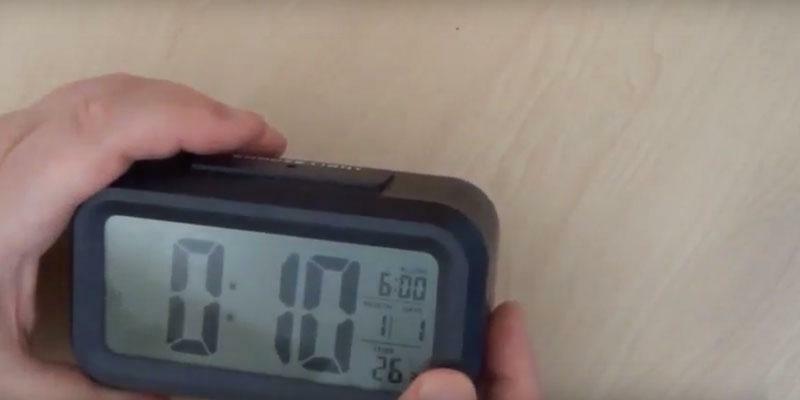 This affordable and simple-in-use alarm clock has all the features any owner may need. If you don't need an expensive product with many fancy extras, this one will surely do. Traditional digital clock in black colour. 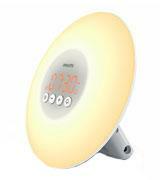 The manufacturer has equipped the alarm clock with an energy saving LED lamp so that it could serve you for life without a need to be replaced. Sunrise simulation helps you awake naturally. The clock is really lightweight and may slide off the bedside table. This little sun in your room will make your awakening really pleasant even on overcast days. Good mood is guaranteed when waking up is a gradual process instead of a shock. 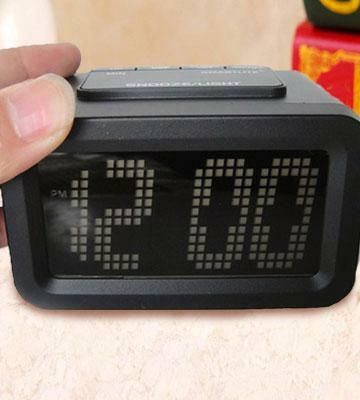 The manufacturer has designed the AZATOM alarm clock to be an irreplaceable device for every family member. 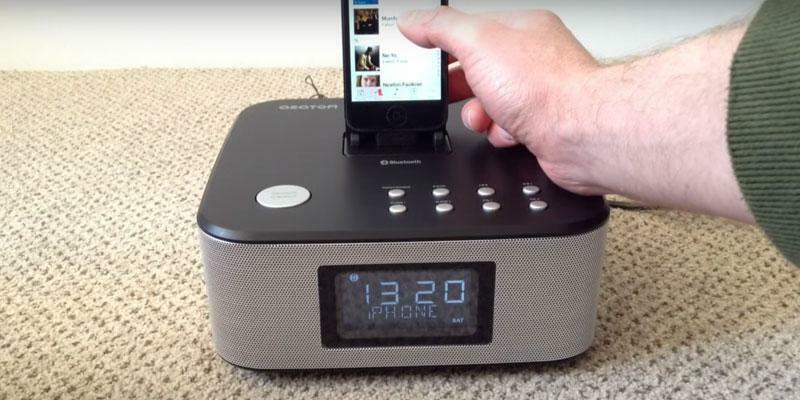 You and you children alike will adore this model since it can be used as both an alarm clock that can be fully customised in correspondence with your needs and sleeping preferences and also as a mini system that can be utilised for streaming music from your Apple devices or listening to your favourite radio stations. We should also mention that the manufacturer has equipped the AZATOM model with the high-quality powerful speakers capable of reproducing low and high frequencies with accuracy, therefore high-fidelity loud sound is guaranteed. 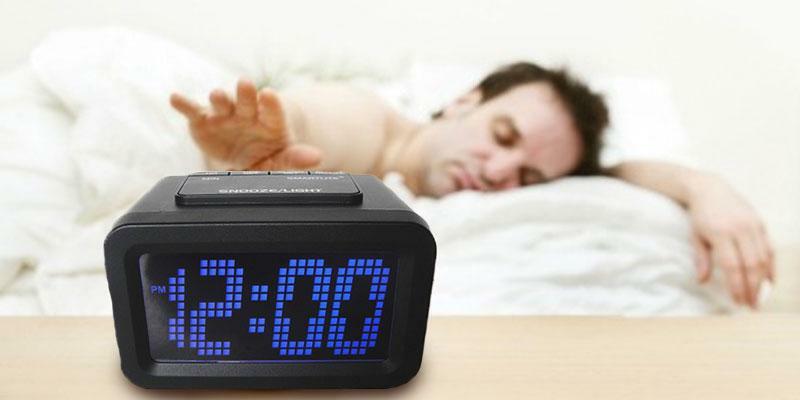 Additionally, the alarm clock has a pretty eye-catching design that won't spoil the interior of any room in your home. Here, the glaze black housing with silver mesh inserts gives the alarm clock a smart finish and contemporary look. 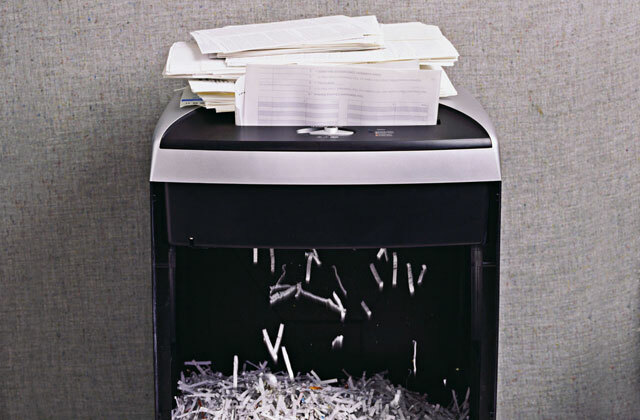 You can easily place the device in a plain sight. As we've mentioned above, the given alarm clock would come in handy for use in any room at your house since it is not only a tool for awakening but also a docking station. However, if you place it in your bedroom as a bedside alarm you will get the device that will fully conform to your temperament and living/sleeping habits. First of all, it offers dual alarm so you and your significant other can wake up at a different time without fearing to oversleep because of improper clock operation. Secondly, it features every day/weekday/weekend modes, therefore you can pre-set the clock to ring only on certain days so that you wouldn't be woken at 6 o'clock on Sunday when you needed to catch up on your sleep. 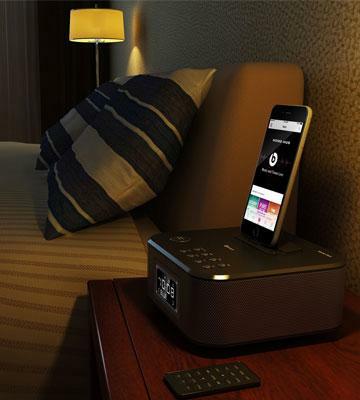 Wake up to your favourite music, pre-set radio station or buzzer and be ready for a new day. All in all, if you are looking for a high-tech and multifunctional device that not only works well but looks great, the AZATOM alarm clock is the best option for you. If you don't want to gain extra kilos and strictly keep your weight trim, bathroom scale is an essential device for you. It will take your heart rate measurements, body fat, muscle/bone balance, and many other data to let you monitor your body condition. 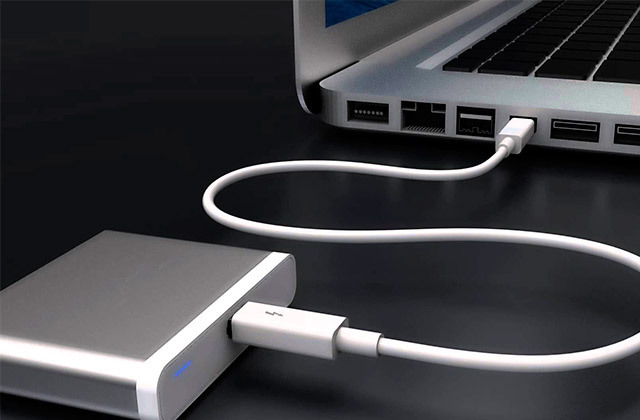 This dock station is fully compatible with any and all Apple products owing to the inbuilt Lightning Сonnector. It is really handy since you will be able to charge your device while streaming your favourite music. To charge your iPhone just place it onto the built-in stand. However, if you need to place a larger item like an iPad install the additional iPad stand attachment. 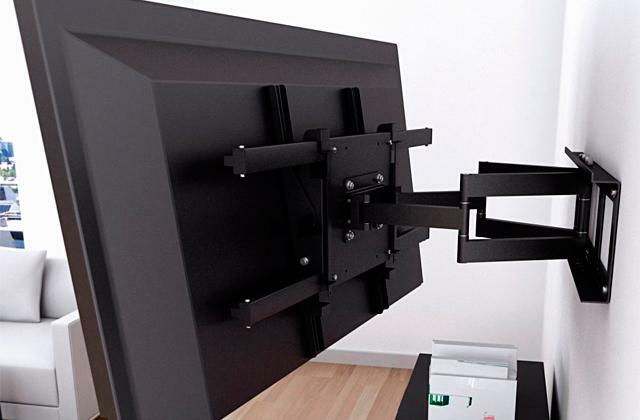 This excellent doc station is literally one-size fits all. 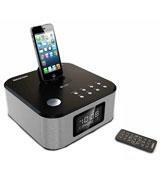 What's more, the AZATOM alarm clock is compatible with virtually all smartphones via Bluetooth, thus you will also get a Bluetooth speaker. It is also worth noting that the AZATOM alarm clock automatically picks off the time and date information from your iPhone or iPad when docked; it means that you don't have to set it manually. No doubt, this Home Hub is really jaw dropping gadget for the price. 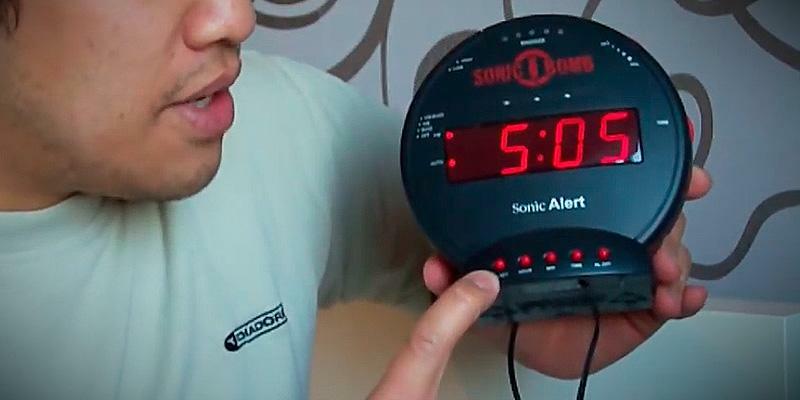 Sonic Bomb alarm clock will literally wake up the dead. 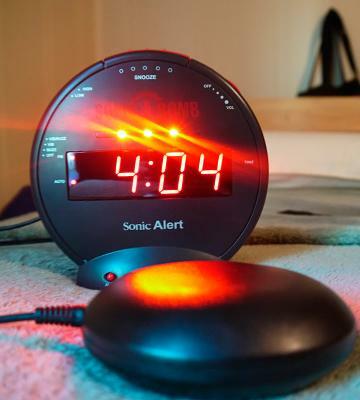 The clock features an ultra-loud 113-decibels alarm along with the bed shaker and a bright red flashing light that will encourage a prompt rise every morning. These alarm options can be used separately or in combination. So, if you don't want to wake your roommate, you can switch off the sound and wake to a powerful bed shaker. With the adjustable volume and tone, you may customise the clock to fit your sound preferences. 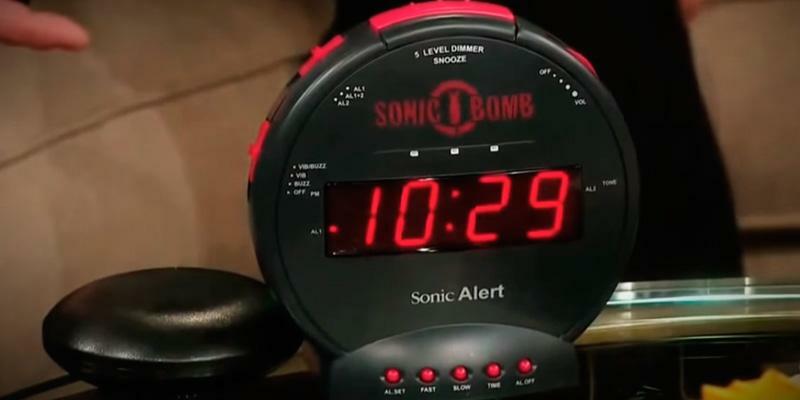 Sonic Bomb has an adjustable snooze interval which can be set from 1 to 30 minutes and also has selectable alarm duration (1-59 minutes). And finally, this clock has a dual alarm, so you can set it to ring twice each day to be sure that you will not sleep through it. Sonic Bomb has a fairly standard 1-inch red LCD display. It shows the time in large numbers and has a 5-level dimmer function, so you may adjust its brightness up to your needs. Sonic has a built-in Alarm & Bed Shaker Test Mode to test the functions and adjust it if something doesn't suit you. 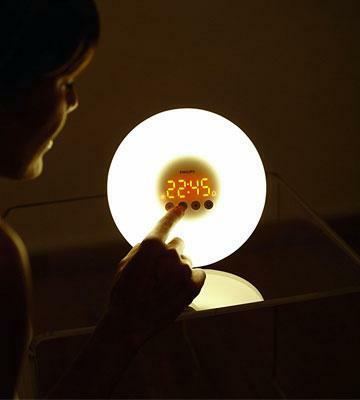 Due to the new green power technology, this clock reduces energy consumption for up to 60%. In case of power outage, the clock has an improved battery backup that keeps the time and alarms settings. Though, you should remember that it doesn't alarm when battery powered. While it does lack several features, this extra-loud and vibrating alarm clock will do its job and get you up in the morning. 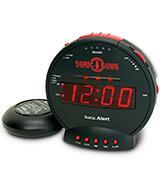 Sonic alarm clock in a "bomb" shape has a metallic black plastic body with the red 1-ich display and red control buttons. Its explosive design will be perfect for cheerful people with a good sense of humour. So either you're a student or a grown up and still a heavy sleeper Sonic Bomb will wake you up in a decent time and vivify the design of your room. Moreover, this clock would be a perfect and nonstandard gift for your friends. 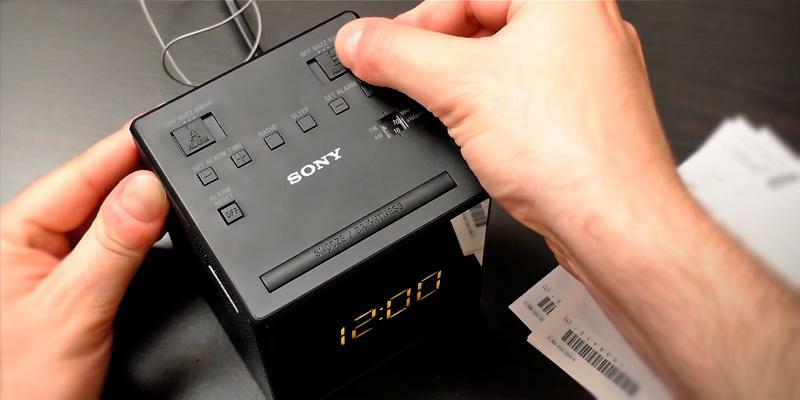 This outstanding alarm clock manufactured by Sony Corporation will wake you up in the way that works best for you and will prepare you for the rest of the day! Sony Projector Dual Alarm Clock features 5 natural sound alarms, hence, you may wake up to the sweet sounds of Ocean waves, Birds, Rain, Brook, or Under-the-Sea. For those who prefer standard buzzer or radio, this alarm clock features such options too. Additionally, you can set 2 separate wake-up times, one for you and the other one for your significant other, and customise them up to your needs. Moreover, you don't have to worry about the alarm clock ringing on weekends as this model features weekend/weekday/everyday modes. 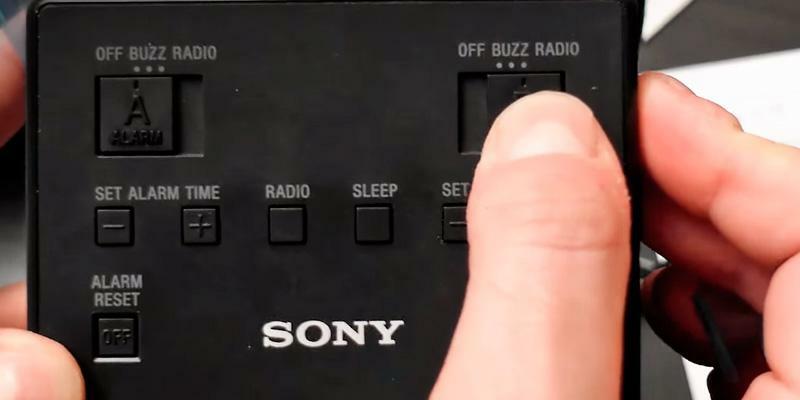 And finally, with an extendable snooze interval and a sleeper timer you may set turning the sound off from 10 to 90 minutes and fall asleep to the radio or your favourite nature sounds. One of the crucial features people look for when opting for an alarm clock is an easy-to-read display. Fortunately, Sony alarm clock features 1.4-inch blue LED display with adjustable display brightness, so you will be able to read the time from any distance. The alarm clock automatically adjusts to daylight saving time and comes with already preset EST. Thus, on buying this clock all you have to do is choose your time zone. It is worth noting that you can customise almost every option here to meet your requirements and enjoy your mornings. For your convenience, Sony is designed with the swivelling projector that allows you to display time on your walls or ceiling with up to 180 degrees' tilt. 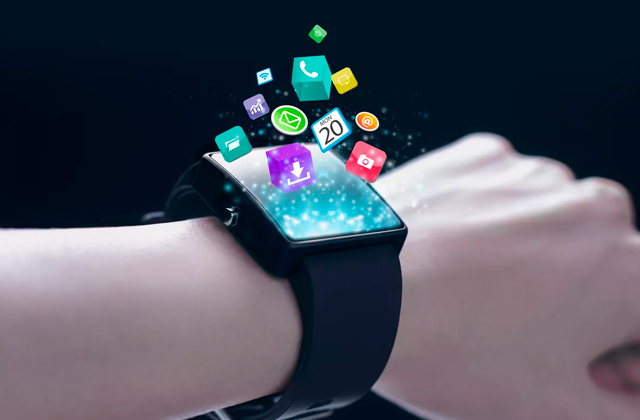 Therefore, if you wake up a dozen times at night and want to know the current time, you can easily catch sight of displayed time without grasping the alarm clock every now and then. 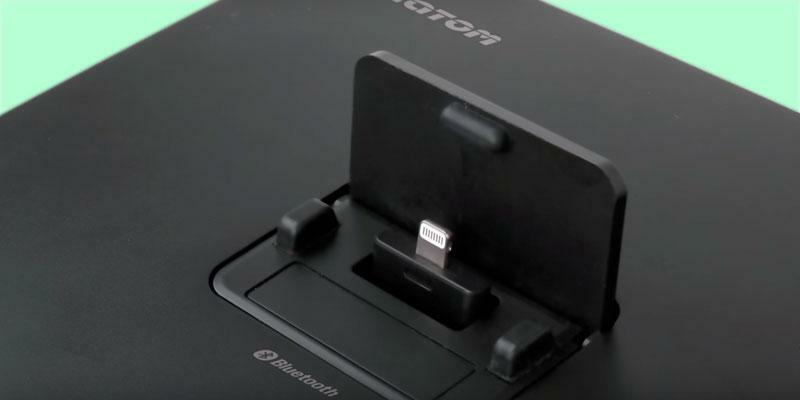 Additionally, this device has a USB port so you can charge your gadgets on your nightstand. 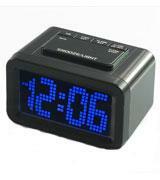 Be sure that the eye-catching design of this alarm clock won't go unnoticed and will please your eyes from day to day. 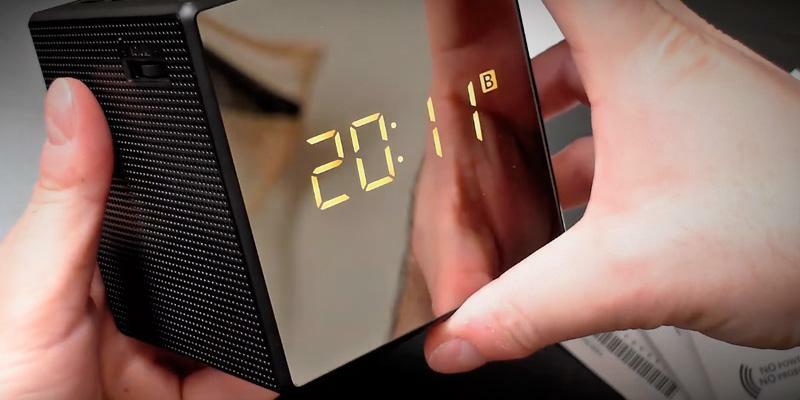 The manufacturer has designed the clock in the shape of a cube with the mirror-finished display. It will suit any interior and become the icing on the cake that is your beautiful room! We are sure that thanks to its design and functionality, your guests will be asking you where you bought it. If you need to wake up at the same time on a daily basis an alarm clock is a must-have for you. Thereby, we may assume that the light emitted by a clock's display may irritate you if it is too bright. If you belong to those who like sleeping in a full darkness, the HITO Smart, Simple and Silent LCD Alarm Clock is the right pick. 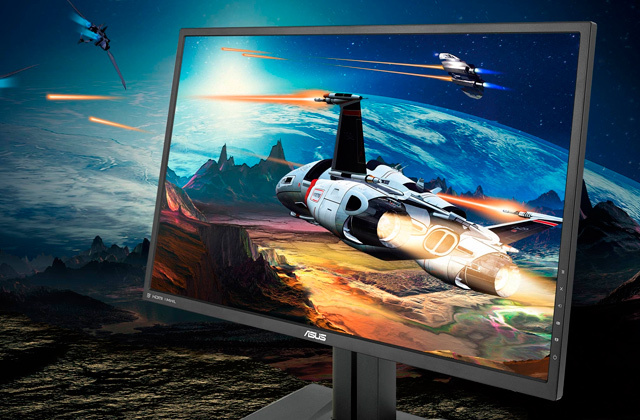 The display can be adjusted to your own preferences from bright to really dim so that it will emit only a very weak glow that won't disturb you at night, yet you will be able to see the figures on it in the dark. 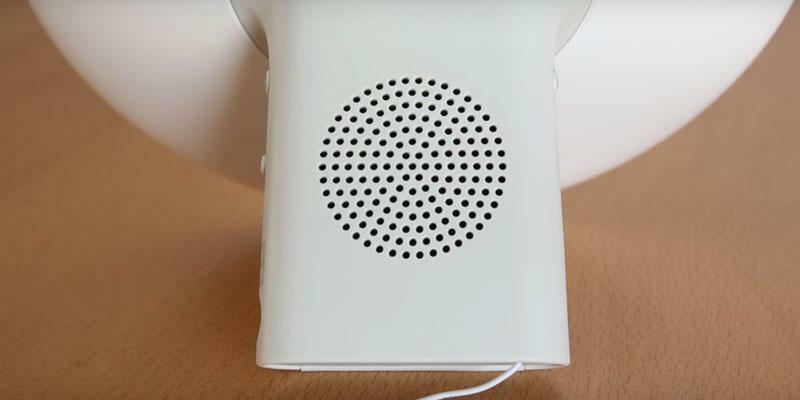 Additionally, the alarm clock is designed with the special sensor that automatically changes bright blue light to soft green light when the room gets darker. Though, if you need to see the current time at night you can always press a Snooze/Light button located on the clock's casing and the Blue Night Light will intensify the illumination just for a few seconds. It's really handy. 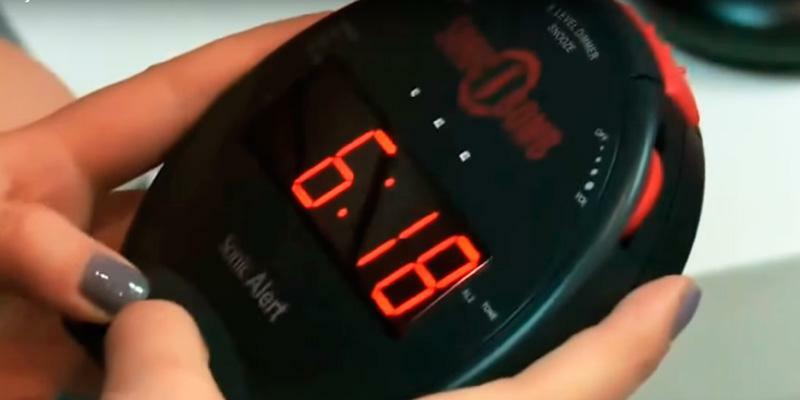 The device offers all the features commonly found in any ordinary alarm clock, though, it still differs from those cranky models that produce annoying beeps and flag the spirits right from the awakening. The HITO alarm clock offers a pretty discreet sound that will never annoy you. It starts off with steady beeps which change in speed after some time and become louder; the alarm signal remains like this till you switch it off or press a snooze button. It won't be a problem to set a snooze even with your eyes closed since the button is located conveniently at the top of the body. 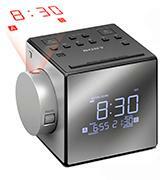 This alarm clock will make both your sleeping and awakening pleasant and will do it at a nice price. The alarm clock from HITO company is the simplest and the most user-friendly device on our shortlist. 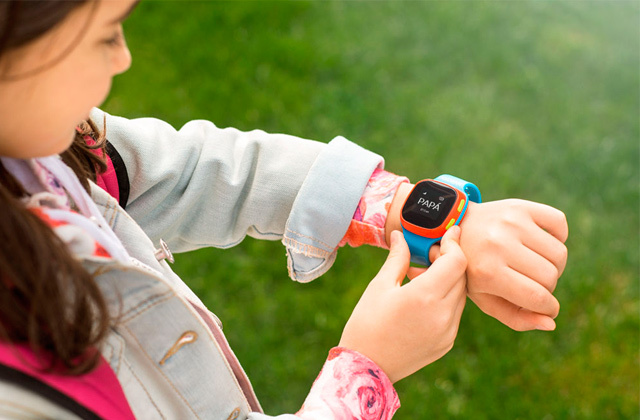 You don't need to be a tech savvy to set the current time or set the alarm, here everything is as easy as ABC. Thanks to its conventional design, the alarm clock would match any interior and what's also important, won't take a lot of space on your bedside table. So, whether you live in a big house or in a small flat you can opt for the HITO alarm clock and be sure that it will not spoil a room's design and will wake you up in a soft manner. We also like the fact that the clock features battery backup, thus the settings won't get busted even after a power loss. What will rejuvenate your body after the sleep and give you the necessary boost for the day is a cold or hot shower depending on your preferences, of course. Choose the right shower head to enjoy calming gentle rain shower over your body. Philips has launched a new kind of alarm clocks that will not irritate you in the morning anymore. The Wake-Up Light series is a clinically proven device that wakes you up with the artificial sunshine in order to make your awakening pleasant and maximally natural. To specify, the sunrise simulation gradually increases for 30 minutes and the colour of the morning light softly illuminates your room starting from the dim yellow light that gradually changes to bright yellow. The given alarm clock will awaken you in a natural way so that by the time you need to open your eyes you will feel bright-eyed and bushy-tailed! Additionally, you can personalise the brightness of the clock choosing among 10 available setting according to your preferences. The quality of our sleep is of vital importance, and a comforter can help you with that. A comforter set will add convenience to your sleep and will guarantee a successful and efficient day. Once you wake up in a room flooded with soft sunlight produced by the Philips HF3500/01 Wake-Up Light Alarm Clock you will feel the difference between this device and ordinary alarm clock and, of course, would never want to change this artificial Sun for anything else. That's why the fact that the manufacturer has equipped the clock with a Liteon SMD Lamp LED is a real catch. The lamp is not only an energy saving but it will also serve you for life without a need to be replaced. Philips Wake-Up Light is not only an outstanding alarm clock that makes the sun rise pretty realistic and energises a user for the whole day; it also features a number of extra features that make the device even more attractive for purchase. The classic snooze feature is a quite handy thing since it allows you to shut the alarm off setting it to ring again in 9 minutes. No doubt, this feature would come in handy for those who love to laze a little in a bed before getting up. What's more, you can even use the Wake-Up Light alarm clock as a bedside lamp as it features 10 light intensities with the maximal one of 200 lux. If you tend to read before bed, this alarm clock would really come in handy. Nice to the feel bedding and the right mattress with pressure-relieving properties make your sleep more sound. Though, what about the air quality in your house? Consider buying an air purifier that will protect you from harmful contaminants, bacteria, and even pet dander. Every day we face the challenge of early awakening. Either we need to go to work, school or even on a hike, we need to set an alarm clock that will force us to get out of bed. As we know, the discovery of the first adjustable mechanical alarm clock is referred to mid-19th century, but it is incomparable to the modern models. Modern alarm clocks are mostly digital with different audio signals, they can speak, laugh, play the nature sounds or your favourite songs. With such device, you will wake up feeling ready for the day. However, if you cannot imagine your day without music, you should consider purchasing MP3 Player. If you decided to replenish your collection of gadgets with a digital alarm clock, first of all, you should take a notice of the Settings. Modern devices can be customised to wake you up in the way that suits you best. 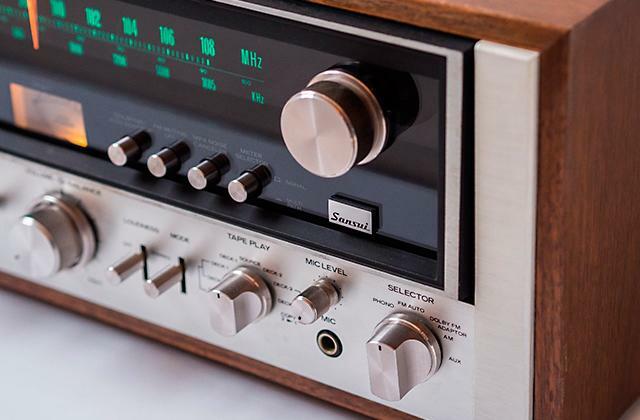 Among the available audio signals, you can choose nature sounds, your favourite radio station or a progressive beeping. But it will work well if you are a light sleeper. However, if you always sleep past the alarm time and affiliate yourself to a heavy sleeper you'd better choose an alarm clock with a snooze function. This function allows shutting the alarm off temporarily and then setting it to ring again at a short time later. You can also consider an option of purchasing the alarm clock with dual alarms. It is convenient for families where wife and husband wake up at different times. As you can see, the more options an alarm clock offers, the easier it is to customise the device. The next important feature in modern alarm clocks is Extras. 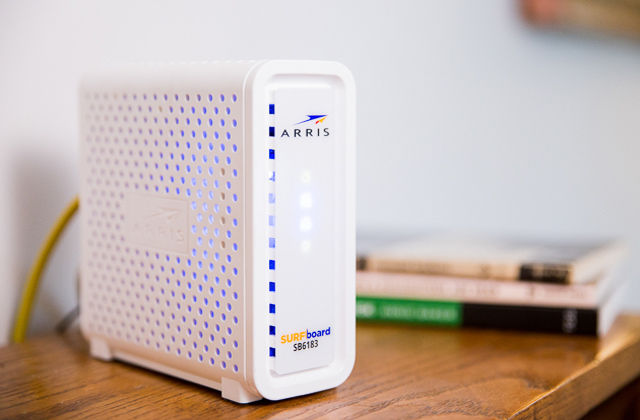 Now you can find devices that not only wake you up and show time but also have built-in projectors that display time on the wall or on a ceiling. So you can see what time it is even without lifting your head up. The clock should come with a high-definition display with large figures and dimming options so that it's easy to customise the settings of the clock. It is also preferable to have an alarm clock that displays temperature and date. There are also models that can automatically adjust for daylight saving time or have an auto sync time function, however, these clocks should be always plugged in. For people who are afraid to sleep past the alarm time in case of power failure, it would be useful to buy a clock with the battery backup feature. 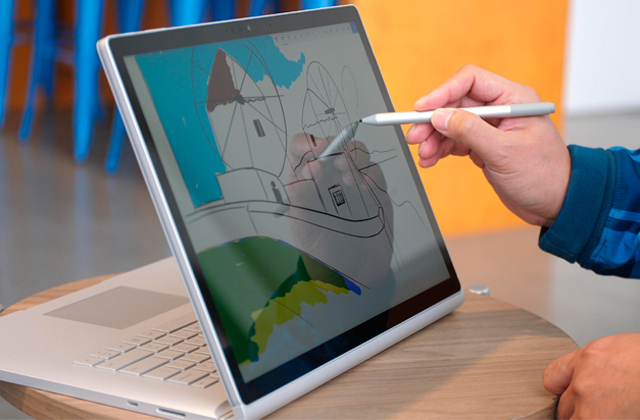 All these extra features are meant for making your life easier. As for Design, alarm clocks look different and hence, may match any interior and style of the apartment. Though, some people decide which clock to purchase depending on its outside appearance only while other people are ruled by its functions. 1. How to Choose an Alarm Clock, wikiHow. 2. Your Guide to Buying a Digital Alarm Clock, eBay. March 3, 2016. 3. Buying Guide to Clocks & Clock Radios, Argos. 4. How to Choose an Alarm Clock, wikiHow. 5. Choosing the Best Alarm Clock, Sleep. 6. Teresa Dumain 20 Ways To Sleep Better Every Night, Prevention. April 7, 2014.